There are many different forms of complimentary medicine available today to help combat the problem of stress and one of the most popular, and indeed tried and tested methods, is acupuncture. Acupuncture is a well-established form of traditional Chinese medicine that has been practised for thousands of years. It requires the insertion of ultra-fine metal needles to be placed at varying intervals on the skin. By placing the needles at various points on the skin the idea of acupuncture is to regulate the body’s chee (spelt Qi), or vital energy, which circulates around the human body through invisible channels called meridians. The idea of stimulating these acupuncture points, which are normally located on the wrists the arms, the feet, and the abdomen, is that it triggers the production of ‘feel good’ chemicals in the brain which are known as endorphins. In addition, it is believed that acupuncture can block pain receptors and stimulate the nervous system. 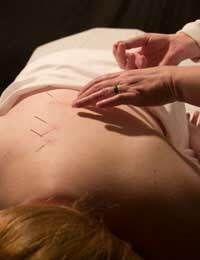 Most practitioners of acupuncture use set acupuncture points to treat various ailments. If you are frightened of needles however, there are other means of acupuncture available such as finger pressure, laser acupuncture (shining a laser pen on certain areas just as you would insert the needles) and heat treatments. Acupuncture has many applications but the most common are the treatment of certain addictions such as smoking. It can also help to alleviate headaches, hay fever, back problems and in more recent times it has been used as a means to combat stress. If you suffer from stress and want to try an alternative form of therapy that does not involve the taking of any medications then perhaps acupuncture is one of the most popular forms of alternative medicine available to you. On visiting a practitioner he or she will ask you as to the nature of your condition and will then set out a course of treatment that they think will be best suited to you. In the United Kingdom alone there are somewhere in the region of three thousand acupuncturists at the present time. You will find many of them are listed in normal telephone directories and can also be found online. Your doctor may be able to advise you on the use of one if you so desire. In recent years there have been extensive studies into the success of acupuncture as a means of alternative medicine and many of these studies have indicated that acupuncture has huge benefits to the individual receiving the treatment – not least the fact that no drugs are being introduced into the system, which may serve no other purpose than to block the effects of an ailment as opposed to actually curing it. For sufferers of high levels of stress the ability to receive acupuncture treatments has come as something of a marvel in recent years. Other forms of alternative therapy such as reflexology, aromatherapy and hypnotherapy have all been proven to work but it would seem that this traditional method of Chinese method is among the most successful. Also, during the process of having acupuncture treatment, the sufferer is encouraged to take time out to relax and be at one with their body and mind, something that a lot of stress sufferers find difficult to do. So not only does acupuncture act as an alternative medicine it can also act as an alternative means of relaxation. You should be aware however that when undertaking a course of acupuncture treatment the acupuncturist will ask questions as to the nature of your lifestyle, i.e. diet, the medical history of close family, sleeping patterns and your current emotional state. It is best advised to be honest and open so that they might find the best form of acupuncture for you.